It is believed that warousoku (Japanese candles) first came to Japan through the introduction of Buddhism and based on an item dating back to the Nara period (710-794 CE) which was made of beeswax collected from beehives. In the Edo period (1603-1868 CE), the cultivation of haze (wax trees), a raw material used in warousoku, flourished in Kyushu and Shikoku, and these candles came into wide use by the masses. With it’s good harbor, Nanao thrived as a port of call for cargo ships that sailed the Japan Sea during this era. These ships brought the wax used in warousoku from Kyushu, and washi (Japanese paper) used in the wick from Iwami (Shimane prefecture). After being manufactured in Nanao, warousoku were transported by the cargo ships once again, to areas across Japan. A candle making cooperative Rousokuza, was established in Nanao, and it continued into the middle of the Meiji period (1868-1912 CE). Today, TAKAZAWA Candle are continuing this tradition. Warousoku have 2 traditional shapes. Ikarigata (anchor-shaped) widens at both the lower and upper parts and narrows in the center. The other shape, bougata (stick-shaped), is of cylindrical form. The term ikarigata is derived from the anchor of a ship, 'ikari' in Japanese. There is both a scientific and aesthetic side to this unique shape. 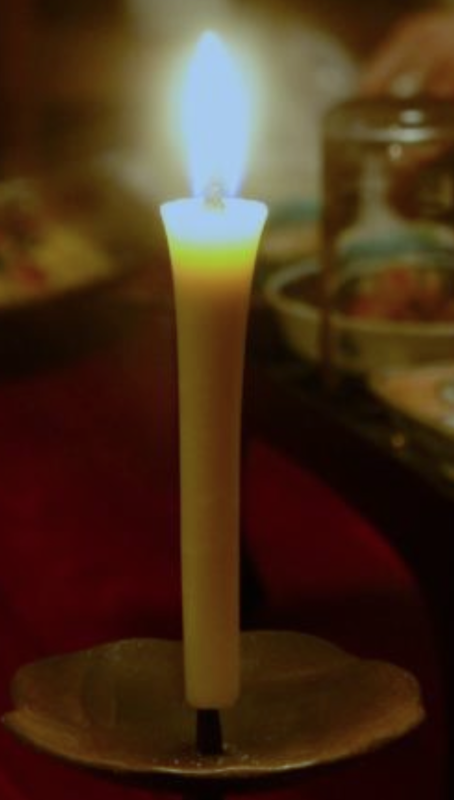 The upper part was designed to widen at the top to prevent wax from running down off of the candle after it had been lit. Additionally, this made the candle pleasant on the eye, and thus it came to have its current distinctive form. Warousoku have 2 main characteristics. One is that they use plant-based raw materials, and the other lies in the special way the wick is made. The candles use a wax that is derived from plant-based raw materials. Specifically, haze seeds, rapeseeds, and coconut oil are used. In contrast to animal-based raw materials, we have plants--these things that grow all around us--share the energy they develop and utilize that to make candles. Warousoku became popular among people together with the spread of Buddhism, and in light of this historical background, one common use of these candles is as a tool for offering up prayer in places of worship. Examples of where they are used include temples, butsudan (Buddhist altars) in homes, and gravesites. They have also come to be used as a way of making time for ourselves in the midst of busy, modern life. Candles can be lit as a way to make time for meditation or yoga, both of which restore calm to the body and mind, to ease tension after returning home from work, or to promote enjoyable conversation with family at dinner time. Their use as a way to make quality time that lasts until the flame extinguishes itself is becoming commonplace. Use a candlestick that is the correct size for the candle. Secure the candle up right making sure it doesn't wobble, and light it in a place out of reach of wind and breezes. A white powder may appear on the surface of warousoku. This is a trait unique to plant-based wax and occurs when the wax crystallizes. It is not a quality defect. While the candle is burning, cut the black burnt part of the wick down to adjust the size of the flame. A specialist wick trimmer is recommended for this. Melted wax may splatter if you extinguish the candle by blowing it out. Warm up wax left on the candlestick with warm water, melt, and rinse. Wipe the candlestick with a soft cloth and make sure to dry the candlestick completely before using it again. Candles will melt if left in warm places such as a car in summer etc. Store them in cool places out of direct sunlight. Warousoku burn with a large, bright flame. 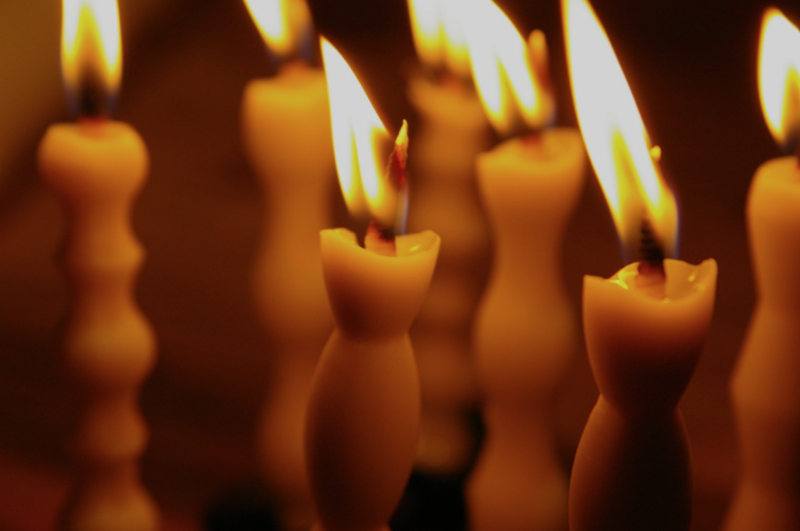 Keep the candle at a safe distance from other items and do not place flammable items above the candle. These are for special private holy occasions. Not for a dinner party, etc. There is an occasion and your own performance when you burn it down. It can be considered similar to lighting a candle in a Catholic Church. We have a selection of these candles at our store in various shapes. Some with Buddhist marks.